Kentucky Athletes, Coach Ready for World Games! 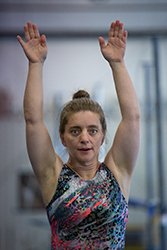 Tonya Cornett practices at Special Olympics USA Team Training Camp last September. The next stop for Kentucky gymnasts Tonya Cornett and Lee Dockins and coach Mary Fehrenbach on their journey to the 2019 World Summer Games is Abu Dhabi!! Ok, there is one in between as the group will fly out of Louisville on March 6 and meet the rest of the Special Olympics USA team in Newark, N.J., before making the jump to Abu Dhabi, but it’s getting closer! Cornett will compete in artistic gymnastics and Dockins will take part in the rhythmic gymnastics competition while Fehrenbach serves as the head gymnastics coach for Special Olympics USA. Once in Abu Dhabi, the Special Olympics USA team will head to a Host Town to spend time acclimating to the area, learning about the culture and preparing to compete. The USA Host Town has yet to be determined, but athletes from all over the world will be in all seven of the United Arab Emirates in what will be the largest cultural exchange program ever in the Middle East. Whatever the Host Town, Cornett, Dockins, Fehrenbach and the rest of the the Special Olympics USA team will return to Abu Dhabi for the Opening Ceremonies on March 14, before the Games get underway the next day. The Games run through March 21 and all three Kentuckians are scheduled to return to Louisville on March 23.